You can’t ski in the summertime…or can you? Trikke (pronounced “trike,” rhymes with “bike”) calls their creations “3-point cambering vehicles” or “carving vehicles.” “Cambering effect” is when your vehicle is propelled by you leaning as you ride. “Carving” is what you’re doing when you turn while slalom skiing. You’re using your body weight to move back and forth in an arc. 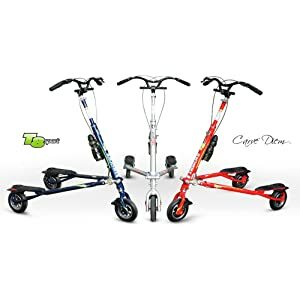 You can also use this same movement to propel yourself up a hill on one of these scooters.Believe us, you will get a full-body workout riding a Trikke. Instead of pedaling or pushing off the ground, you’ll rock your body side to side, and back and forth, to move forward. Even with all this movement, it’s less strain on your knees than other kinds of exercise like biking. The first Trikkes went on sale in 2000. Time Magazine soon named it one of the Best Inventions of the Year in 2002. A few years back, we reviewed some of those early models for you. Since those first scooters appeared, Trikke added electric-powered vehicles as well. We’ll review one of those below. Since this is one of the basic models, it does not have a foldable frame and comes with hard polyurethane wheels. But they call it “convertible” because you can swap the wheels for air-filled tires and have a smoother ride. With the original hard wheels, avoid riding on wet surfaces and uneven ground. Trikke warns that the polyurethane wheels lose traction on wet ground. The handlebar height is adjustable with a quick-release lever, so it’s easy to share a T7 with a friend. (If you’re willing to share, that is.) If you need to transport it, you can remove the front axle with Allen wrenches to fold it for travel. Some of the other Trikke models fold without needing to be taken apart. Check out the other two foldable models described below. Although you may buy it just for fun, you’ll soon see that riding a T7 will exercise all your major muscle groups. Trikke says that their vehicles are great for low-impact workouts even for persons with arthritis and other difficulties. If you can stand and balance, you can probably ride a Trikke T7. The T7 weighs 25.6 pounds and comes in just one color scheme: white with black accents. Trikke offers a 12-month limited warranty. See how to ride a Trikke with this brief video. The demonstration shows how to start, stop, and turn. One hint: although photos often show people riding the Trikke in a crouch, keep in mind that those are typically action shots. Start by standing straight up and tall; adjust the handlebar for your height. Then follow the steps below. If you’ve worked up a sweat riding your Trikke T7, no worries. Even if you’re on vacation camping out, you can shower off anywhere with this portable solution. It’s surprisingly simple to ride and takes up less space than a bicycle. You’ll get a full-body workout. The wheels can be upgraded to air-filled tires. Parts like the brakes and wheels can be replaced by the owner. It comes with the hard polyurethane wheels that lose traction on wet surfaces. Unless you buy it pre-assembled, you’ll need to put it together with someone else to help. Users have reported that this process takes time, patience, and a few tools like Allen wrenches and a rubber mallet. Trikke says that the T8 Sport Scooter is their most popular model. It comes with 8.5-inch air tires with disc brakes and an aircraft grade aluminum frame. It’s designed for teens and adults from 5-foot 3-inches up to 6-foot 8-inches in height, and 250 pounds in weight. Unlike the T7, the T8 comes almost completely pre-assembled. You’ll just need to mount the front wheel and handlebars. You may need to adjust the brakes. The T8 also folds up for easy transport—you won’t have to use any tools to take it apart to put it in your car. The T8 has some other nice extras. It comes with a water bottle and bottle holder attached to the handlebar post. The improved brake levers come with a parking brake. It also features Velo Atune molded handgrips, fenders on the wheels, and rubber grip mats for your feet. Just like the T7, the T8 has a 12-month limited warranty. Take the Sport Scooter on your next vacation. Since you’ll need both hands to steer and ride, and you won’t want a camera banging against your chest, check out this simple solution. You’ll be able to bring your camera along and have it ready for the perfect shot in just one second. The air-filled tires make for a smoother ride. The T8 is made for tall adults to enjoy. You won’t need to spend much time putting it together before you can ride the first time. All the little extras make this less like a toy and more like a commuter vehicle. Even though you don’t have to do much to assemble it, you’ll still need to put in a little work. It also weighs more than the T7 Fitness. 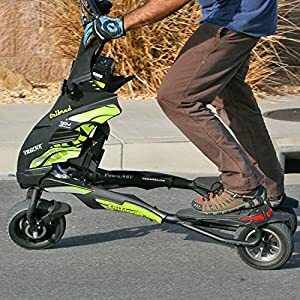 If you’re not always in the mood for a workout but you still love to ride, the Trikke 48V Deluxe Electric Scooter is made for you. Ride it to work in the morning while using the electric motor to keep from getting sweaty, then exercise by using your body to power it home. It folds up quickly without any tools so you can take it on the subway with you. This is truly the premium model of the light electric vehicles that Trikke makes. The Deluxe Scooter (also known as “Pon-e”) runs on a lithium-ion battery that recharges from empty in just 5 hours. It can travel up to 24 miles on a charge when it’s set to the “Econo” speed of 12mph. On “Express” speed, it goes up to 16mph and travels up to 15 miles. If that seems slow, just take this scooter down a hill. Because of the freewheel in the motor, the T8 can go a lot faster downhill than it can uphill. Control the scooter speed with the twist throttle built into the handle. The LED lights on the throttle will show you how much charge you have left, or you can glance at the battery cover. Like the T8, the scooter has an aircraft grade aluminum frame so it’s very strong. It holds up to 250 pounds, and is designed for people from 5-foot to 6-foot 3-inches tall. It has disc brakes and a parking lock. But these aren’t the same air tires that are on the T8. These motorcycle grade air-filled tires are 2.5 inches wide. The ones in the front measure 10 inches tall, and 9.5 inches in the rear. The aluminum rims have sealed ball bearings for durability and less friction. What makes this a deluxe light electric vehicle is its 350-watt brushless free-wheel hub motor. If you are an aficionado of power tools, you may already know why a brushless motor is a top-of-the-line choice. Brushless motors run cooler, quieter, and more efficiently than regular brushed motors. They get the most power and runtime out of a battery, and they last longer overall. We already mentioned that the removable battery in the Pon-e, or Deluxe Scooter, is lithium-ion. This is a great choice as well. Li-ion batteries don’t have memory effect which means you can top them off without worrying that the battery will have a reduced capacity. They run well even in freezing temperatures. Just don’t leave your li-ion battery in a hot place for a long time, and store it with 30 to 50% charge in it. Trikke says their battery lasts for up to 500 full cycles and has a capacity of 11.25Ah. Warning: here is a video that will make you want the Pon-e in the worst way. You can exercise—or not—depending on your mood. It has an electric motor powerful enough to carry an adult up a hill, and it reaches a top speed of 16 mph. That’s four times faster than the average person walks when they’re in a hurry. It also has a longer warranty than either of the other two models. At 46 pounds, it weighs more than either of the other two scooters. You’ll also have to remember to charge the battery if you want to use the motor. Your owner’s manual will give you the exact details on how to maintain your scooter. This is a basic overview to give you an idea of what you’ll need to do. Trikke suggests lubricating your scooter occasionally, or else giving it a complete overhaul every 2,000 miles. Use machine or motor oil on the axle and joints. Use multipurpose bearing grease on the cambering joint. They also recommend tightening all bolts. If you get your Trikke wet, be sure to dry it well and let it air out for a few hours before you put it away. If you get it wet with salt water, rinse it with plain water first, then dry it. Before you ride, test your brakes. You may need to adjust them occasionally. Please wear a helmet and other safety gear just like you would for riding a bike or a skateboard. A bad fall means you might not get to enjoy your Trikke for a while. The polyurethane tires on the T7 Fitness may slide on wet surfaces. Avoid riding in the rain and through puddles. Trikke also doesn’t recommend riding on gravel or off-road. Another tip you may not have considered: don’t spin the handlebar 360 degrees. Yes, it’s capable of turning in a complete circle, but you run the risk of causing the brakes to lock up. We know you want your new 48V Trikke to keep running as long as possible. One of the keys to getting a lot of miles out of your electric scooter is to take good care of your battery. Here are some tips for giving TLC to your power source. Don’t charge your battery if it’s hot to touch. Let it cool off for a few minutes. Don’t leave your battery in a hot car or out in the sunshine on a scorching day. Top off your battery instead of draining it to empty every time. When you store it, leave it charged to 30-50% and keep it in a cool, dry place. Yes, you can still have fun while wearing a helmet. Here are some safety essentials for your Trikke bike. The Schwinn Thrasher Helmet is one of the top selling helmets on Amazon. It’s lightweight, well-ventilated, and has a safety light on the back. We hope you’ll never need to find out how effective it is at protecting your noggin. Protect other essential body parts besides your head. These pads are made of tough plastic on the outside with soft gel padding on the inside. The adjustable Velcro straps make them fit teens and adults. Clip this bright LED light to your handlebar or helmet. It has high, medium, and strobe settings, and recharges in 2 hours. With this on your handlebar, you’ll always know what’s behind your Trikke. If you have the T8 or the Pon-e Deluxe Electric Scooter, you’ll need a way to fill the tires with air. This bicycle tire pump measures air pressure precisely. It’s capable of up to 160psi, which is plenty for your Trikke. After you’ve had a good workout with your Trikke balance bike (carving scooter, electric bike, motor scooter…call it what you like), crash on one of these excellent air loungers. They’re small and light enough to pack in your backpack. If you’re planning a camping trip, sleep well after a long ride on one of these top air mattresses.